@Pᴀᴜʟsᴛᴇʀ2 I can have a small break now, I was looking a video on roller tappets and flat tappets. So the engine block you have can use either setup? But the flat tappet is the standard, so if you want to use the roller tappets you need to adapt some things in the block? The camshaft you have is going to need to have lobes that match the type of tappet you choose right? @IanC - The roller tappets have what is called a "spider". It is a thin piece of metal which holds "dog bones" onto the lifters which keep the lifters oriented so the roller is square with the cam. There are three bosses (pieces of protruding metal) which have holes drilled/tapped in them, which the spider is bolted down to. The bosses sit in the center of the lifter valley. I'll see if I can find a picture for you real quick. If you look at the metal piece running down the middle, you'll see three bolts. Under those bolts are the bosses. The metal piece is the spider. The dog bones are the pieces of metal which the ends of the spider come in contact with. This is an ugly picture of the lifter valley without the spider in place. You can see two of the three bosses in this picture. I had to drill/tap these today. @IanC - And yes, the cam profile for the roller lifter is completely different than it is for a flat tappet lifter. I guess I got a bit confused with the first picture, the spider purpose is to keep the lifters (either flat or roller tappets) pointing in the right direction? So dog bones are actually the pieces that will help keep the spider in position, fixing two points together? And in the picture the lifters are hidden under the spider? @Pᴀᴜʟsᴛᴇʀ2 I understood the camshaft profile though, the roller tappet can endure the round profile because it will roll over it, while the flat would get stuck and wear the pieces fast. So the roller tappet can actually hold the valves open for longer and open them faster right? The spider is just for the roller tappets. Flat tappets have to turn or they will get destroyed. The spider is an elaborate spring. @IanC - That's absolutely correct, as well as allow them to close faster. @Pᴀᴜʟsᴛᴇʀ2 Damn, I think I got it! The roller tappets come in pairs for that engine right? Because it's a 4 valve per cylinder? 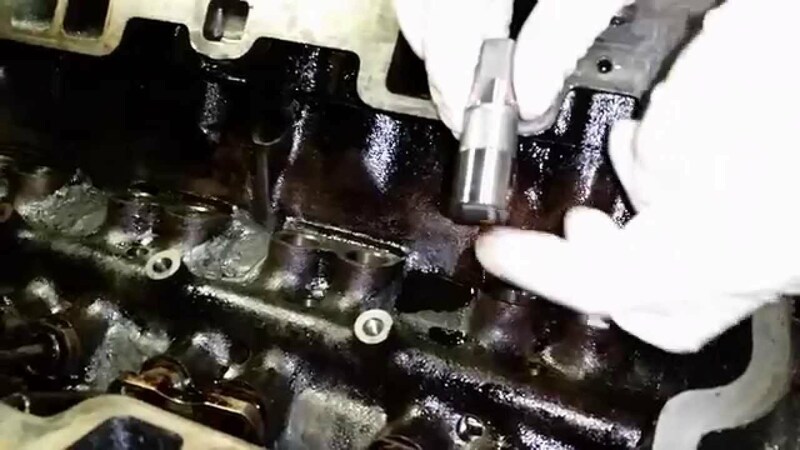 Then the dog bones hold 2 of those roller tappets pointing in the right direction when they are pushed by the camshaft, but are fixed in the spider so just the tappets rise and push the valves? @IanC - It is only two valves per cylinder. One intake and one exhaust. It is an eight cylinder engine. The dog bones do hold 2 roller tappets, though. The tappets push on the pushrod, which pushes on the rocker arms, which push on the valves. The tappets move individually, yes. if it was a flat tappet they would be fixed in a way that allowed them to move up and roll a little at the same time? Similar to the connecting rod of a piston? @IanC - A flat tappet has to rotate. There's nothing holding the to an orientation. Nothing like a connecting rod of a piston, though. It's still a cam, which means there is base circle (when the valve is closed) and a cam lobe (as the valve opens/closes). or am I making some confusion with the tappet movement? @IanC - Sounds about right! last doubt is, how do the dog bones keep them from rotating? The part of the tappet its fixed to has some hole or dent that keeps the piece from rotating? The dog bones are along the bottom. Well, if it's any consolation, I've not done one either! Q: What are the longest spark plugs? Specifically, I'm looking for spark plugs with lengthy electrodes for an engine I'm building. Longer than 2 inches would be ideal. say, if I got my MAF sensor, PCV valve, and engine gaskets replaced 6 months ago, and now I'm getting a "system too lean" engine code again, should I be mad at my mechanic? @alexw - What exact codes are you getting? "System too lean bank 1"